Because our laser vision correction experts are complete ophthalmologists and vision correction specialists, they offer more than just LASIK. If you are seeking the best possible outcome for your vision, then it is best to consult a comprehensive ophthalmologist and not just a LASIK eye surgery chain. Although LASIK eye surgery is a great procedure and has helped millions of people see without glasses and contact lenses, it might not be the best vision correction option for you. After a thorough preoperative evaluation, the staff at Texas Eye and Laser Center can begin to understand what your best options are. If LASIK is not the best option, then our center will not offer the LASIK procedure. Instead, they will suggest a better option. In some cases, the best vision correction option will be photorefractive keratectomy, or PRK, which is also known as Advanced Surface Ablation. 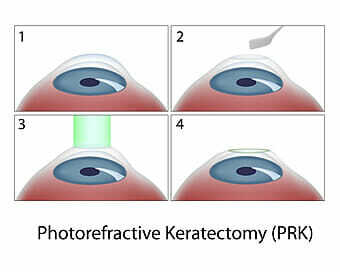 PRK is very similar to LASIK, and both of these eye surgery techniques are referred to as refractive surgery. PRK was the first laser refractive surgery approved by the FDA, receiving final approval in 1995. PRK is a safe refractive procedure that utilizes the excimer laser to reshape the cornea and improve nearsightedness, farsightedness, and astigmatism, much like LASIK eye surgery. The amount of tissue reshaped depends on the severity of the prescription. In most cases, 5 to 10 percent of the cornea is removed. Once the cornea has flattened or steepened to an optimal shape, light rays are more easily focused upon the retina. PRK differs from LASIK in that no flap is created prior to reshaping the cornea with the excimer laser. PRK preserves more corneal tissue and is safer for certain patients. In LASIK, doctors prefer corneal flap creation to allow a faster recovery period. The procedure can be performed using only anesthetic eye drops. A speculum will be positioned to hold your eyelids back, just like in LASIK, so that you eyelids will not interrupt the actual surgery. The ophthalmologist will then remove the outer cornea cells and proceed with the actual laser treatment. The laser delivery takes less than one minute to complete for most patients. Once the laser treatment (refractive ablation) is completed, the corneal curvature has changed, thus improving the refractive error. Your ophthalmologist will then place a bandage contact lens on the eye for improved comfort along with anti-inflammatory and antibiotic eye drops. PRK is a safe, effective alternative to LASIK for many potential refractive surgery patients. PRK results are very similar to LASIK results. In general, PRK patients will have a somewhat slower recovery period. Please feel free to consult one of our staff to better understand the advantages of PRK and whether or not this would be a good option for your vision. Postoperatively, most patients will need to be reevaluated one day, three days, one week, one month, two to three months, and four to six months following the PRK procedure. The bandage contact lens can usually be removed in 5-7 days when the epithelium is healed. Most patients will only require eye drops to control healing during the first 6 to 12 weeks, and may require topically applied medications for up to 6 months or more following the procedure. In general, the greater the refractive error, the more likely the patient is to require eye drop medications for a prolonged period following the procedure. Visit our LASIK risks page for more information.